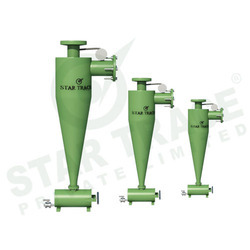 We are renowned Cyclone Separator manufacturers and suppliers.It is widely used for classification for section I and II closed circuit grinding, regrinding fine mine classification, mud removing prior to and after selection, and dam and back fill for gangue. It offers excellent efficiency of classification than conventional screw graders. We use the finest grades of metal alloys and other basic components for manufacturing these and offer these at competitive rates to our clients. With Hydrocyclone Separators we have immense technological expertise in manufacturing and supplying premium gamut. 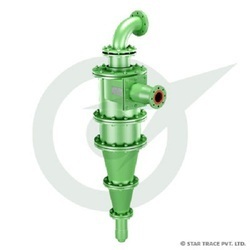 This enabled us to offer Hydrocyclone Separators to our prestigious clients. These are extensively used for classification, regrinding, mud removing operations and are highly acclaimed for seamless performance under demanding conditions. We maintain rigid norms of quality and produce these in our state of the art facilities. Looking for Hydrocyclone Separator ?